PIN hosted 3 of her projects at the Lagos Social Media Week which took place from 22nd to 26th February, 2016. Beginning with the SMWDigitalJobs hosted on Monday 22nd, PIN gathered more participants at the SMWTENT session on Tuesday 23rd and SMWNetRights on Thursday 25th. Overall, a total of 197 participants attended the three interactive panel sessions which held at the Hootsuite, Master Class and Innovation Stages respectively. 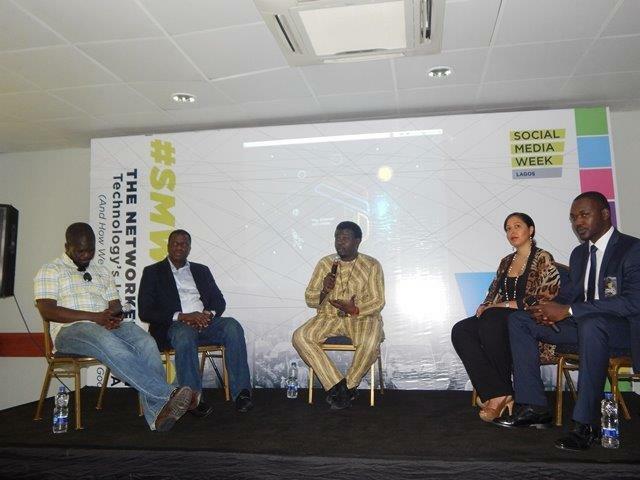 SMWDigitalJobs’ themed ‘Using Skills to make money from virtual employment’ featured panel speakers such as Elijah Otor and Gbenga Adebiyi who are successful online workers; Tele Williams- Program Manager at Digify Bytes, Ugochukwu Nwosu- Stakeholder Officer, Rockefeller Foundation in Nigeria and Ghana; and Adebola Oni- CEO, NaijaMotivation. The interactive session was moderated by PIN’s Chief Operation Officer- Temitope Ogundipe and participants were informed about how to make the most of their time working online. One of our success stories, Elijah Otor, established that ‘online work is not a get-rich platform, since patience and consistency is required to succeed as a freelancer’. Speaking further, Ugochukwu Nwosu, Stakeholder Officer Rockefeller Foundation in Nigeria and Ghana mentioned the need to acquire useful skills for online work. In collaboration with the Office for ICT Innovation and Entrepreneurship (OIIE), PIN also hosted #SMWTENT session on Tuesday 23rd to discuss the theme ‘Industry Opportunities For Tech-Savvy Students & Graduates’. The event was attended by 10 students from Federal Government Girls’ College, Sagamu, alongside other participants. Discussants on the panel include Bunmi Okunowo- National Co-ordinator, OIIE at the National Information for Technology Development Agency (NITDA); Akin Oyebode- Executive Secretary, Lagos State Employment Trust fund; Nkem Begho- CEO, Future Soft Nigeria and Akin Ogunsola– Cloud Services Expert at MainOne. This session re-iterated why most companies are in search of the passionate individuals and not certificated ones. Speaking about validation process, Bunmi Okunowo expressed the need for start-ups to ‘fail fast’ and ‘learn fast’; while Nkem Begho encouraged participants to learn like their lives depends on it. One of PIN’s [email protected] students, Makanju Perfect demonstrated his newest software application called SelfieVP. He made the statement while answering a question from the audience on how to regulate the online space to ensure Citizens don’t insult Public officials. Also, ‘Gbenga Sesan while speaking at the event said Citizen must not outsource their responsibilities to a few activists. The event was very engaging and ended on a high note with participants yearning to ask more questions. The key lesson from the session was the need for Citizens to take up the responsibility to defend their rights. This point was emphasized by both speakers.